Usain Bolt has always been talked about like he’s an elemental being, an athlete not bound to the laws of nature. When he set the world record in the 100 meters for the first time in Beijing, he visibly slowed and celebrated as he crossed the line, costing himself at least 0.1 seconds. He then set a double world/olympic record in the 200m into a headwind. It looked like he wasn’t trying, and his speed didn’t so much disarm critics and rivals as much as his casual, jovial nature. It looked easy because, for him, it was. But after those 2013 Worlds in Moscow, he didn’t really race much for two years. Hamstring issues slowed him in 2014, but he showed up to help Jamaica set a Commonwealth Games record in the 4 x 100. Meanwhile, a new 100m king was emerging. Justin Gatlin, 33, sat out from 2006-2010 after a doping ban, but quietly built a very strong resume, a failed NFL stint aside. He beat Bolt in June 2013, then after Bolt won the Worlds that August, Gatlin would not lose the 100m again for two years. That is, until this morning, when Bolt came from behind to beat Justin Gatlin by 0.01 seconds to win the 100m gold medal in the World Championships in Beijing. Bolt’s 9.79 wasn’t especially fast by his standards, but after Gatlin got off the blocks slow, it was enough to take the race at the death. In a sport where greatness comes and goes, and there are always little marginal gains to be had, sprinters never tend to reign at the top for too awful long. 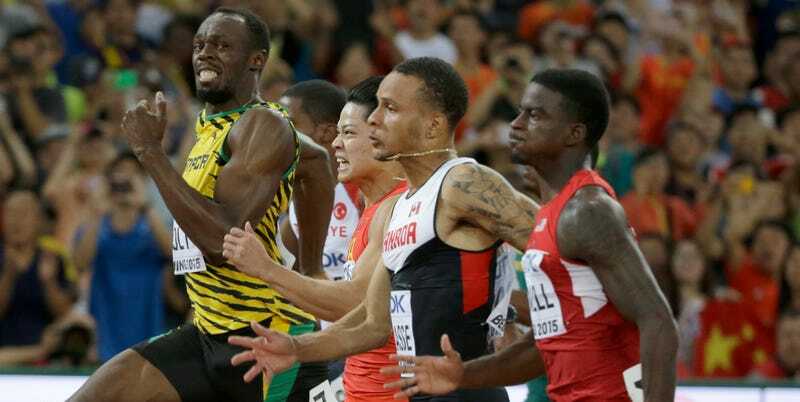 While not as gutturally impressive as his ability to push the edge of human performance forward, Bolt’s ability to stay the fastest, to not decay, is quite the feat.